My last full day in Iten began with breakfast. 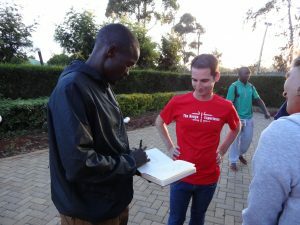 We were meeting Abel Kirui in the evening, but that morning we had a track workout. Before leaving I wanted to complete my last workout on a high note. As we met outside the High Altitude Training Centre, we voted on the track we would use. Between Kaminary’s dirt track and Lornah Kiplagat’s new all weather track, we decided that Kiplagat’s track would suit us better. 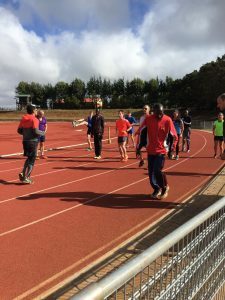 Although the Kaminary track would feel more “Kenyan”, it would have been difficult to focus because many athletes were working on intervals that day. We exited the camp and jogged a little over 2 kilometers to the spot. 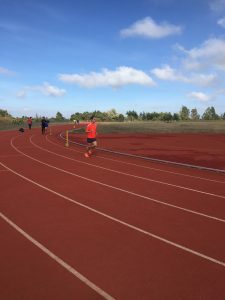 After warming up we began 1,000 meter repeats with 200 meters recovery. I locked into the equivalent of a 5:40 pace per mile on the first 4 repeats. I thought, “Not too bad for running at 7,500 feet above sea level.” I ended up taking it down under 5:30 pace. It seemed about right. After all, I had just completed a 5 mile race in New York right under 5:40 and had clocked under 5:00 for a mile earlier in September. 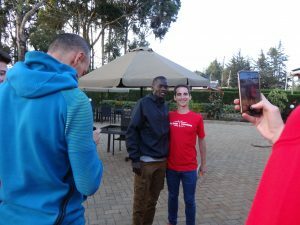 I thought the paces at Kiplagat’s track gave me a good idea for what time I should aim for when running the Boston Marathon. I said to myself, “Now, I need to work on maintaining a pace for longer distances.” After completing the workout we jogged back just in time for tea. Later that afternoon we met Abel right outside the camp at a local restaurant. 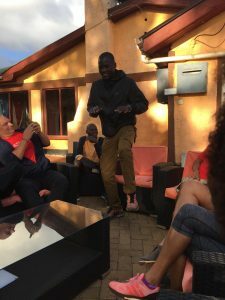 Jovial, determined and hard working, he arrived with a smile and many stories to tell. Kirui holds back-to-back wins at the World Championships in marathon distance. In 2016, he won the Chicago Marathon after coming back from a series of injuries. I enjoyed hearing him talk about his upbringing as well as how became a professional runner after high school. We listened as he continued to talk about his training. He even reenacted his victory dance in Chicago! Abel works with world-renowned coach Renato Canova. In order to complete a Canova plan, an athlete must possess a strong mind. As many will say, “Your legs might fall off under Canova’s training.” The mantra, “train hard, win easy”, echoes throughout Kenya. 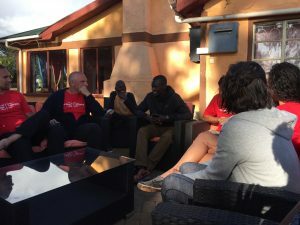 Kirui mentioned that competition is balancing out the training. Every athlete who works with Canova seems to build the race they want to run. The last lap in training might go quickly, but that moment prepares a runner to go for the win. All of the training still includes the proper balance between hard sessions and recovery to ensure that athletes perform at their best. Abel’s personality inspires me to pursue my new found love for running even when I’m not excited to head out to train. Sometimes runners push too hard and become defeated. 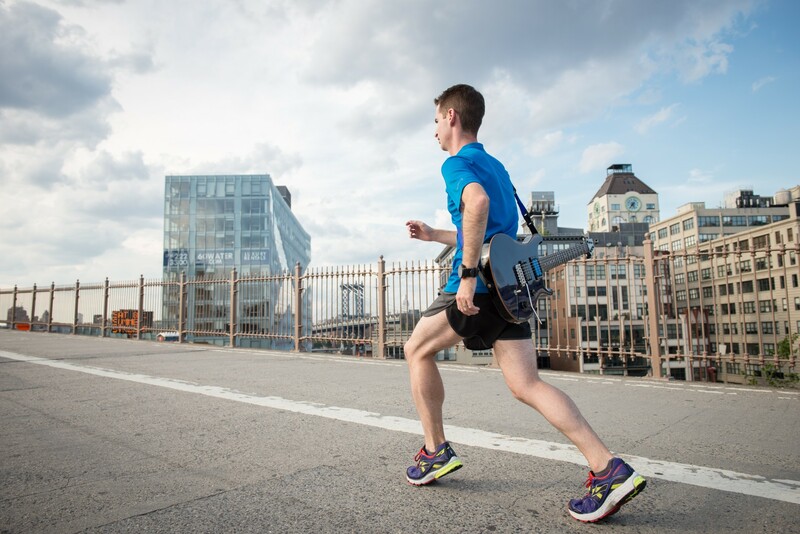 When we focus only on numbers and data in order to reach that new personal best, running can weigh us down. Although runners focus on their training in Kenya, most go by feel (I still haven’t met a Kenyan who uses a heart rate monitor). With Abel, I saw he loved his profession so much that he would probably continue running once he retires from competition. No matter how far I go with running, I always hope to share the same joy for the sport.